A back road in the Tetons National Park, taken at Thanksgiving 2010. Fuji Velvia 100 slide film on the Pentax K1000, this was the first roll of color I’ve put through the Pentax, amazing results! Really nice otherworldly feel to this–beautiful shot! Great camera location. Love the big view and the blues. such a beautiful scene. lovely! The way the landscape is covered in snow here, really gives it that wow effect! What a wonderful scene. Nice composition. The road really does lead you into the landscape. Gorgeous!! An absolutely magical winter landscape! 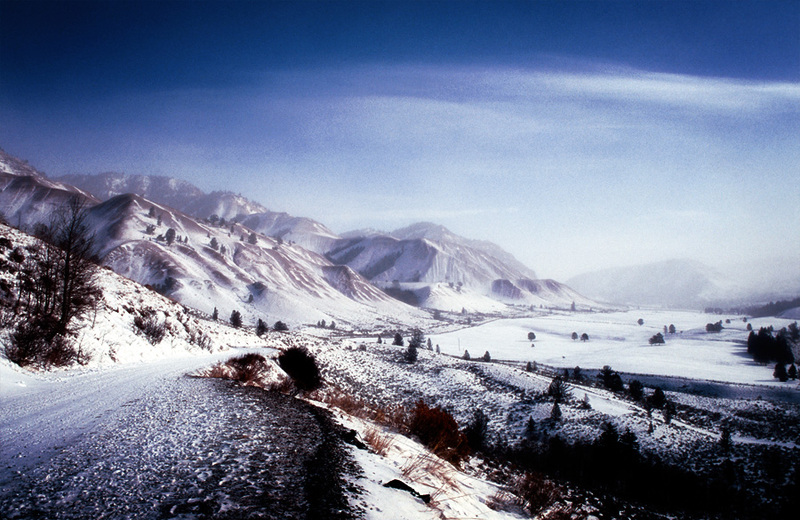 Fabulous wintry landscape – it feels like a still out of a movie. Great work! Wonderful photo, love the view and this atmosphere. Nicely capture of this cold, peaceful winter scene. what a great picture! the mist and the grain make it look a bit like a painting.